The original Mario Kart on the Super Nintendo was a game that quite literally ended friendships back in the day. 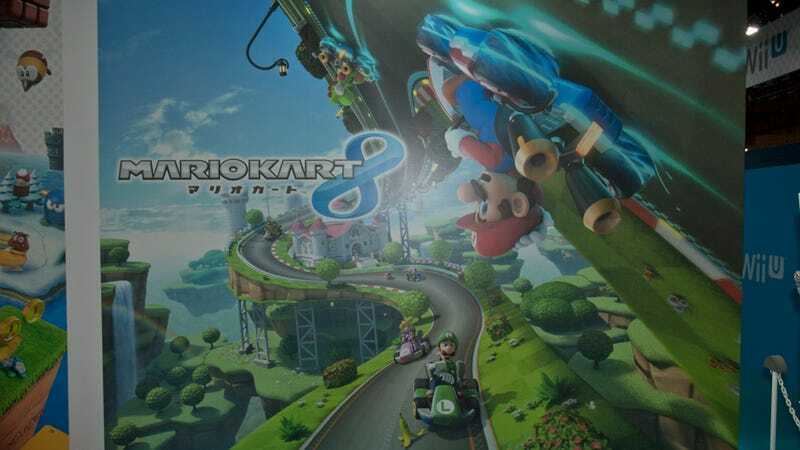 Now, over two decades later, the latest addition to the series, Mario Kart 8 is headed for the Wii U next spring, and I got a chance for a little hands-on time at this year's Jump Festa 2014 in Japan. I should probably preface this by stating that I have not played any of the Mario Kart games except for the original. I kind of avoided the series after watching a match between a couple friends end in punches, so I haven't really kept up with how the games have evolved. That said, playing the demo for Mario Kart 8 was quite fun. First off, I got to choose from 12 characters: Mario, Luigi, Peach, Daisy, Yoshi, Bowser, Donkey Kong, Toad, Wario, Waruigi, Koopa, and Toadette. Sadly, the baby characters and Rosalina were not available in the demo. After choosing Mario, I got to play through 3 courses: A standard circuit with one upside-down area, a resort circuit with obstacles and hidden paths, and a haunted circuit with traps and an underwater area. Overall, the game mechanics are fairly intuitive – press the A button to accelerate, the right trigger to drift, use the directional key for items, and rotate the controller to steer. By going off of a big jump, you also automatically open a glider that you can then control the pitch of by tilting the controller. Being a demo, the courses were pretty straight-forward. I imagine that with some time and practice, I could probably have performed a lot better, but in the end I managed – with some difficulty at points – to come in first on all three races. Visually, I have no complaints. The bright atmosphere works to enhance the feel of the game and I never got tired of looking at the screen, or any motion sickness for that matter. There are areas where courses run upside-down, but the screen remains normal with your surroundings upside-down, so when you're concentrating on driving you never really have a chance to appreciate it. I had more fun driving sideways on the walls because your character goes sideways, making it more engaging and mixing things up. One potential drawback is the fact that you use the Wii U controller as a steering wheel. While the controller itself isn't that heavy, long hours of use could lead to some very tired arms. Also, because you're turning the controller to steer, I'm not sure if/how you'll be able to play on just the controller. Mario Kart 8 is scheduled for release in Spring, 2014.